Cut pork into 1/4-inch slices. In medium glass bowl, mix reserved pineapple juice, soy sauce, honey, garlic and cornstarch. Stir in pork. Cover and refrigerate 1 hour. Cook and drain vermicelli as directed on package. 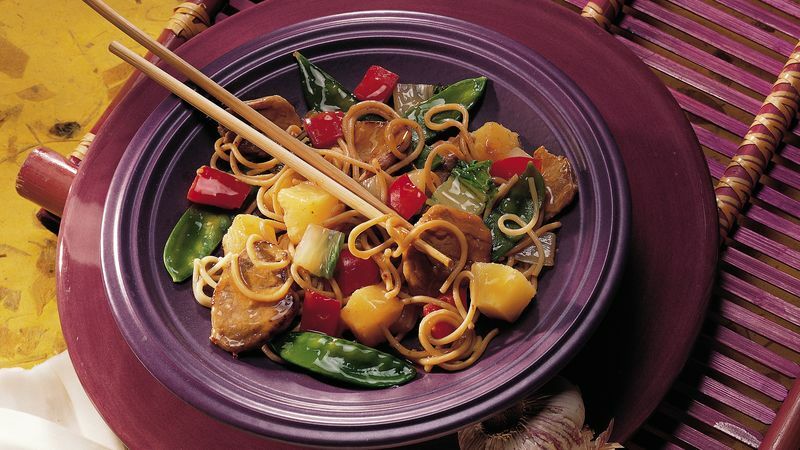 Spray wok or 10-inch nonstick skillet with cooking spray; heat over medium-high heat. Add oil; rotate wok to coat side. Add pork; cook and stir 2 minutes. Remove pork. Add broth, onion, bell pepper and bok choy to wok; cook and stir 6 minutes. Add pea pods, pineapple and vermicelli. Cook 2 minutes, stirring constantly. Add pork. Cook about 1 minute, stirring constantly, until sauce is thickened and pork is no longer pink in center. Bok choy is a mild, versatile vegetable that resembles a bunch of wide-stalked celery with long, dark green leaves. Whole wheat pasta has three times the fiber of regular pasta. Use 1 cup sliced celery for the bok choy.